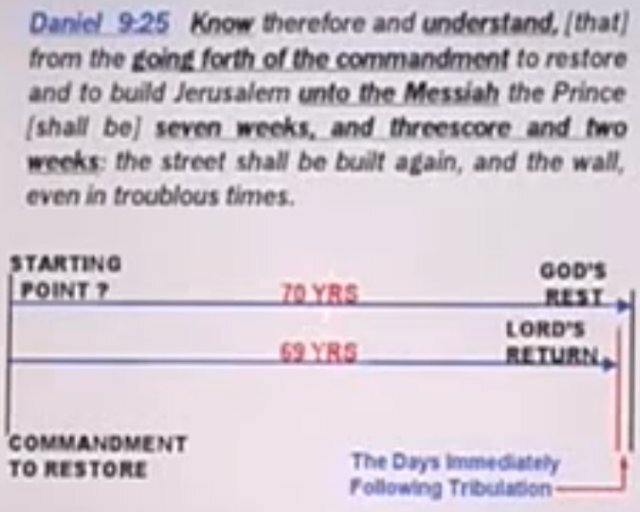 Could the 62 weeks of years of Daniel 9:25 already have happened, with the 7 weeks of years yet to take place? Have you seen this video series, http://www.youtube.com/watch?feature=endscreen&v=aNnZ1T2H3Gc&NR=1? I’ve watched the entire series (12 videos in all) and it appears compelling. One thing he does is look at Daniel 9:25 and says the 62 weeks of years already have happened, with the 7 weeks of years yet to take place. What do you think about this? It is not easy for me to find the time to view things that people ask me to look at, such as a lengthy video series. I finally found some time to watch videos 4-12, which allegedly point to Daniel's timeline. This series was not compelling or persuasive to me at all, and I would not recommend it to anyone. There are numerous holes in his theory, and I do not have the time to list all of them. Furthermore, I feel that people should believe whatever they want to believe, and I have no desire to compel anyone to believe something else. So, really, my opinions about someone else's views are immaterial. In that fourth video, he notes that shabuwa indicates a period of seven, such as in seven days or seven weeks, and that Shavuot or the Feast of Weeks (lasting seven weeks) is one example of this. These things are true. But then he focuses directly on that particular example, the Feast of Weeks, and makes one of the foundational tenets of his theory be that the prophecy of seventy weeks in Daniel 9:24 must imply seventy years, each of which will include one Feast of Weeks. Thus, he arbitrarily is forcing 70 weeks of years to be 70 years, since he needs a period of 70 years to "fit" into his overall theory that the prophecy is referring to the 70 years from 1947 to 2017. As far as I am concerned, his assumption of 70 years, rather than 70 weeks of 7 years per week, is the first big crack in his foundation. 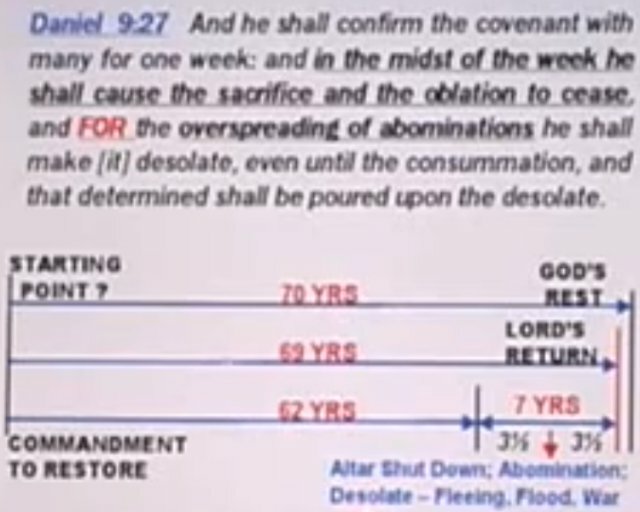 However, the person who made the video series isolates the 62 weeks in Daniel 9:26 and makes it start at the same time that the count of the prophetic 70 weeks in Daniel 9:24 starts. This is another serious crack in his foundation, but to make it worse he creates yet another crack by adding on the 7 weeks of Daniel 9:25 after the 62 weeks. So he has reversed the order of the 7 weeks and the 62 weeks in this important biblical prophecy and, essentially, has constructed his own prophecy on top of a very cracked and defective foundation. He even calls this a "prophetic baseline," which means he acknowledges that this is the foundation upon which he is going to build his own personal theory. 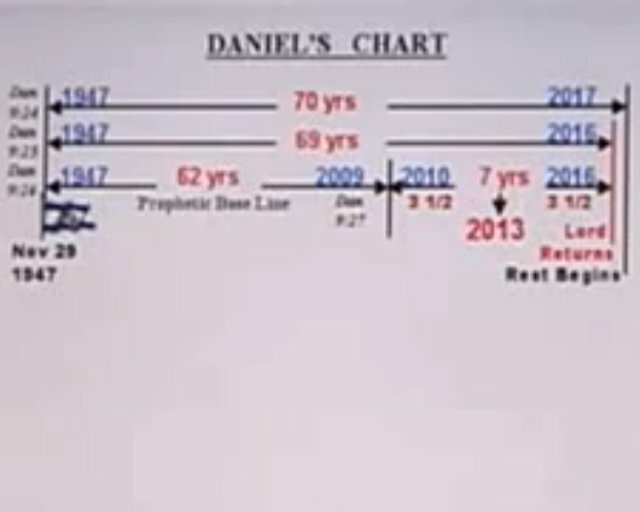 In his diagrams below (which I also will attach), he clearly shows the 7 years following the 62 years (which he has placed in reverse order), and then he calls that 7 years the prophetic 7 years of Daniel 9:27. In addition, he advances the notion that each of the prophesied "weeks" is a year, until he needs for the "week" in Daniel 9:27 to be a 7-year period, and then that is what it magically becomes. This is an egregiously flagrant series of errors and may constitute the biggest fracture in his already unstable foundation. Moreover, he even has a dangling space at the end of his chart and explains it by saying, "This appears to be a year in between here, but this is not necessarily so." He refers to this segment simply as "the days immediately following the tribulation." In the seventh video, he states that this interval is 45 days in length. So on the one hand, he needs for those days to be insignificant in length because everybody knows that Jesus will return at the end of the final 7 years (the 70th Week). On the other hand, it would be convenient if that little segment at the end were a full year in length because he needs the full 70 years to "fit" into his overall theory. He even has the "Lord's Return" at the end of the 69 years, with "God's Rest" happening at the end of the full 70 years. All of this makes absolutely zero sense. 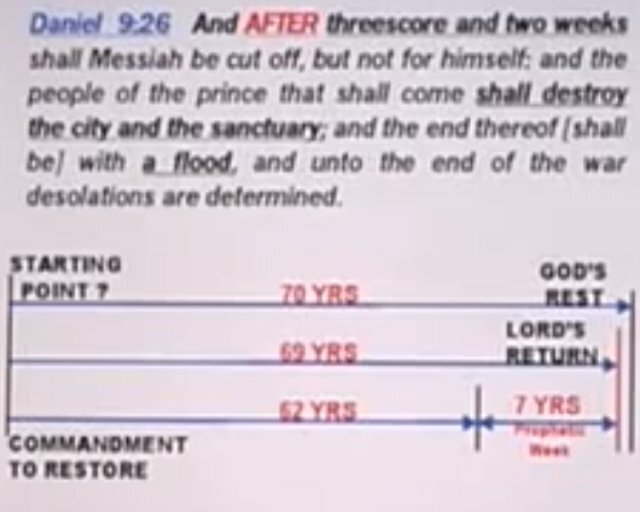 Furthermore, he never gives an explanation as to how the Messiah/Lord will be "cut off" (Daniel 9:26) at the end of his proposed period of 69 years. That is because the original prophecy was describing 69 weeks of years, after which Jesus would come into Jerusalem on Palm Sunday (Luke 19:28-44), be anointed by the woman (Matthew 26:6,7,12), and be crucified by His enemies (Matthew 27:33-35), all within a few days of each other. 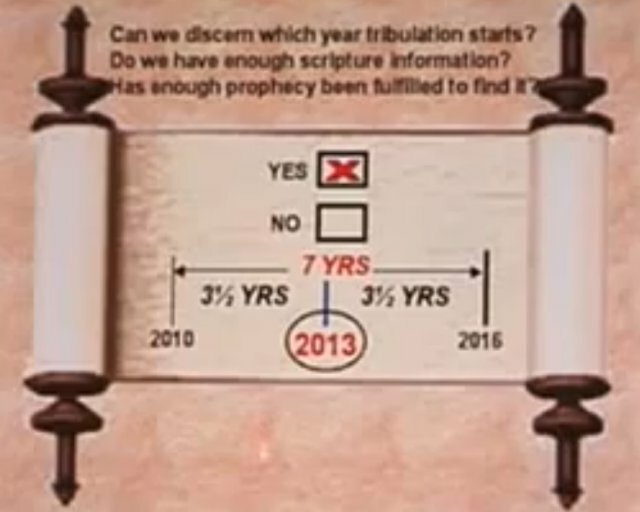 In the sixth and seventh videos, he has the final 7 years before the Lord's return as 2010 to 2016, which is only six years, unless the count is made from the very beginning of 2010 to the very end of 2016. This is the only way to allocate a full seven years, according to his charts. I went ahead and watched his remaining videos and found numerous things with which I disagreed. It would be too time consuming to list them all, so I will mention only a few. He takes the 1,335 days from Daniel 12:12 and makes that be the length of the final 3½ years plus an arbitrary period that he refers to as "the days immediately following the tribulation." He subtracts 30 days from the 1,335 days and makes the time from the setting up of the abomination that causes desolation to the point of "God's Rest" be 1,305 days. He makes other arbitrary designations of various time periods as well. I agree with none of that. Jesus will return to earth on the 1,260th day, which will be on the day of Atonement = Yom Kippur. There are 75 days from that day until the beginning of Hanukkah; and after Jesus returns, this will be when the Millennial Temple will be dedicated, just as the second temple was dedicated during the first Hanukkah. This will complete the 1,335 days, which will be 45 days beyond the Battle of Armageddon. See more details at 30-days and 45-days. Even so, the sun turning dark and the moon turning red (Matthew 24:29) are signs of the opening of the Sixth Seal (Revelation 6:12,13), which will take place well into the final 3½ years. Yet, he has this taking place during the middle year, 2013, of his proposed 7-year period. I cannot afford to spend anymore time commenting on this video series. Suffice it to say that as "compelling" as some of the things he says might be to you, remember that the foundation of all of it contains serious fractures and is very unstable. As such, I cannot accept his proposed Daniel's timeline of 2010 through 2016 (or 2017? ), especially since I saw no confirmation of a 7-year covenant involving Israel during 2010.